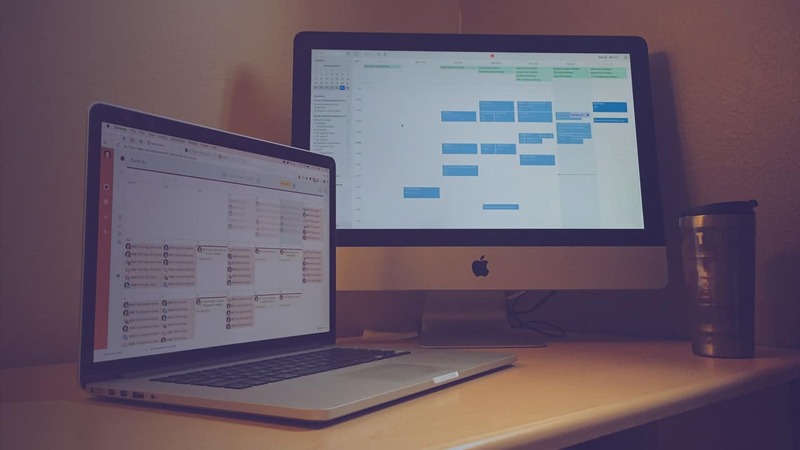 A simple editorial calendar strategy can greatly increase your productivity and effectiveness. A great man once said that “if you fail to plan, you plan to fail.” While I don’t fear failure I never plan on failing. Nobody does. But the hard fact is most people don’t take the time to put together a solid plan when it comes to their social media efforts. Is it a lack of focus? A lack of clear-cut goals? Or is it just not knowing where to start? Well I’m effectively taking that last option off the table for you. If you have trouble with the other two, you are always welcome to schedule some time with me to help you work through focus and goals. In the meantime, let’s start with a plan. I’m going to give you at least a basic idea of how to plan your content (social and/or blogging) calendar. It’s not rocket science. Some of you may even think, “that’s too simple, give me something more.” Well before you ask that, let me as you this— are you doing the simple work? Okay, I won’t go into a rant about procrastination and excuses— let’s just do this. Deal? Before we get started though, I wanted to state that the first step should always be identifying your audience and topics. To keep this post simple and to-the-point, I’m assuming you’ve already done that work. Fair enough? Cool, let’s get started. Start with a calendar, any calendar will do. If you’re a pen and paper kind of person (like my wife) then do that. If you’re a digitalist like myself, use your digital calendar of choice. 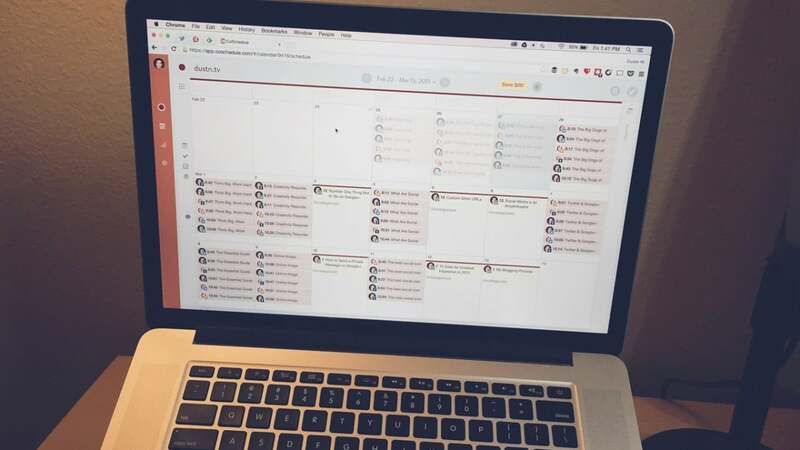 You might actually want to take a look at Coschedule, one of the newest additions to My Toolbox. Editorial and Social Media Calendars from Web. Search. Social. Next, identify all the holidays or special events happening in the calendar month ahead (or the one you’re currently in). If there are any special days in that month, be aware of them and create or curate content that will be relevant/trending on that day. Tuesdays = #StarWarsTuesday. People post interesting/funny things about Star Wars and use the hashtag. Wednesdays = #BufferChat. Buffer does a weekly twitter chat. Fridays = #TGIF or #FridayDanceParty. I’m determined to make that a thing. Saturdays = #Caturday. People post interesting/funny pictures/videos of cats… yeah, I know, but it’s a thing. Find those weekly trends that people in your target audience will be participating in and/or interested in and put them on the calendar. Twitter chats, trending topics, weekly events (such as TV shows) are great ways to join in on a conversation that is already thriving and be exposed to a larger audience. Bonus Reading: Learn everything you need to know about Twitter to maximize your content marketing potential on that platform. Remember though– be relevant, not just a trend-jacker. Now here’s where the real work is. Day in, day out– feeding the content monster (as my friend Justin Wise once put it). Informational: Things that feed their knowledge. Inspirational: Things that fuel their fire. Entertaining: Things that make them smile. Make it your daily goal to fill all three content types. This goes back to understanding the psychology behind why people share things. I’ve shared about this in one of my Insider newsletters, but to save some reading time on this one I’ll just recommend you go look up Contagious by Jonah Berger. It’s a fantastic book with incredible insights. Every day you’ll want to fill your content queue with all three types of content. Shoot for a ratio of 25/25/50. Or maybe your audience is more into being inspired and you’d want to make the 50% portion inspiration and the other two 25%. 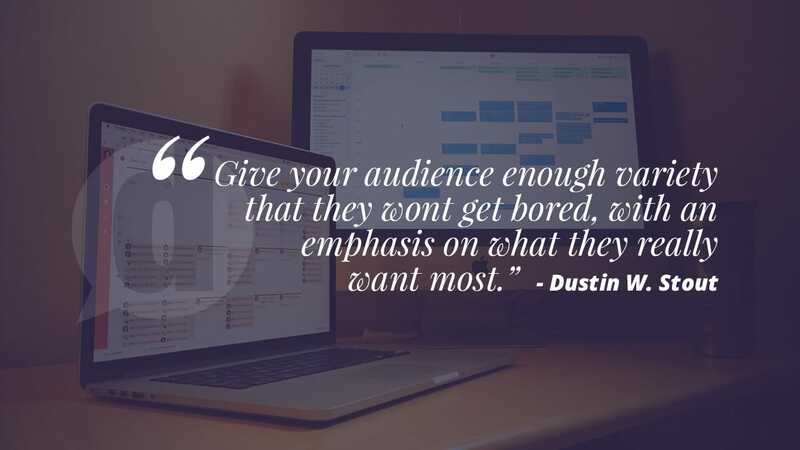 The point is to give your audience enough variety that they wont get bored, with an emphasis on what they really want most. Now how many posts a day does this mean? Well, I’ll let you decide. Maybe it’s an easy 4 times a day. Maybe it’s 12. Gauge the volume tolerance of your audience and go from there. Whatever number you choose, try to keep it constant and realistic because you need to feed that content monster every single day. To feed this content monster you either need to be both creating content and curating. So first decide how much you can create and how much you need to curate. Or maybe you want to start by seeing how much you can curate and then create the rest. Either way, fill that daily quota. Some days will be easier than others and the weekly events/trends and monthly holidays/events will definitely help, but the idea is to create a content plan that will become a routine. Once you’ve got a plan and a routine you can expand, refine and experiment. For further reading on the subject my friend Peg Fitzpatrick has shared her thoughts on How to Get Organized with an Editorial Calendar, Buffer has a great piece about Choosing a Content Calendar, and Matthew Kaboomis Loomis has shared some great thoughts on why bloggers need a content calendar. Never trade quality for quantity. More than anything else I believe you should lead with quality over quantity. There’s no shortage of content out there. The problem is sorting through it all to find the real gems. If you can position yourself as a maker and curator of quality content you will stand out among the crowd of link-litterers and auto-posters. You can do better. You will do better. Now go to work. Bonus Reading: Take a look at my other productivity tools that help me stay efficient day in and day out. What do you think? Simple enough to act upon? 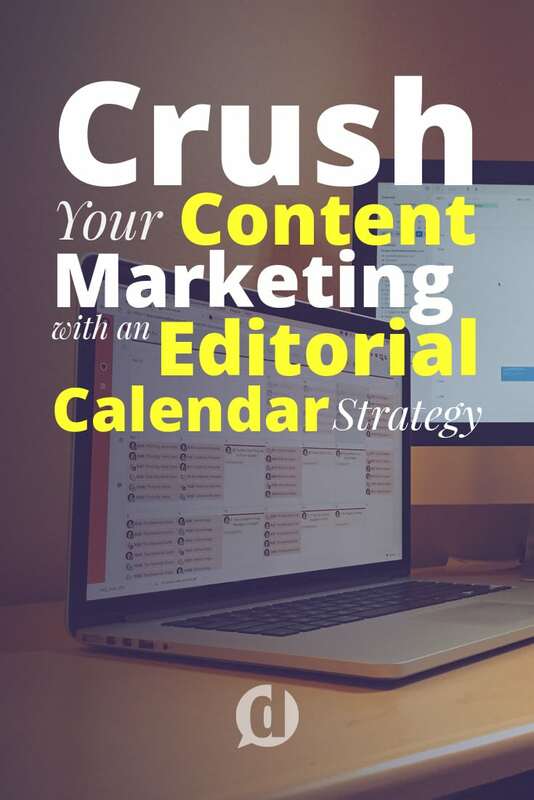 Are you already working an editorial calendar? You can leave a comment by clicking here. A social media blogger and speaker who loves helping people tell bigger, better stories online. Founder of SoVisual.co, Co-founder of Social Warfare and an unashamed coffee addict. Join over 40,000+ social media marketing pros! And have my best content and freebies set straight to the comfort of your inbox. On top of that, get instant access to a digital library of downloadable resources. Just add your email below. I have worked on pinterest but I schedule the same posts for right now ontheirthat i do on instagram. I do planonwriting contentreally soon that speaks to my audience and will be helpful for them and making a nice infographic for them and putting those posts on pinterest. Would that be the way to go? :) any feedback you give will tremendously help! Really really helped me out! You helped me gain focus again and even more in depth this time. I run an ecommerce store but use Instagram as my main source of traffic. But i believe with a more genuine thought out plan i will get more people coming back:) thanks so much! Already bookmarked your blog and will come back for more! Keep up the great work! Awesome Adnan! Curious, have you been getting a lot of traffic from Instagram? Historically, I’ve found it to be the most difficult network to get traffic from (Pinterest being the easiest). As an ecommerce shop, I’d much sooner encourage you to work on Pinterest for traffic and use Instagram for branding. Have you tried Pinterest (or other networks) for traffic? Good to hear taija! Do what works for you– that’s the only way to love what you do. Excellent I have bookmarked this one to refer to. I think this advice will really help me in my journey forward. Thank you. Great Stuff Dustin! I love … enjoyed your article. And agreed, we never plan to fail in the beginning, but without a strategic plan in place whether it’s our commerce marketing or social landscaping strategy … “Failure” is inevitable. In addition, when I initially started with this noise IM gig — thing, all three [lack of focus, lack of clear-cut goals, and not knowing where to start] seemed to be a part of my daily routine. Though it took me some years to finally pull it together. I’ve also found a lot of great ideas [value] from the article and it will take me some time to catch-up with you on all the tasks you’ve given us to do. BUT … I’ll get’er done! And, I’ve been using Google’s calendar which I like a lot; I’ve even gone as far as scheduling various online activities, but been too busy trying to get the site done. Once again … I really like the article, and I’m following your example. Glad you like it Kevin! Well once the site is done you may want to give Coschedule a try– it integrates with your Google calendar!